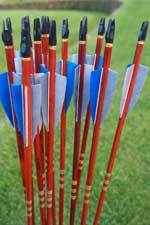 Without well matched arrows we all struggle for consistency and improved scores. At the Longbow Emporium our intention is to provide you with the very best matched arrows available. 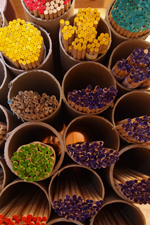 Port Orford Cedar or Chris Boyton Pine are recognised as being the best traditional arrow woods available to us today. 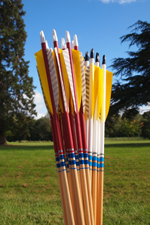 Our arrows are priced and sold by the dozen however please contact us if you want them in any other quantity. See more images of Marc’s matchless arrows here. 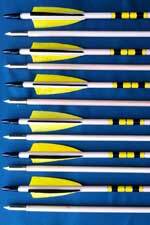 These are excellent quality starter or club arrows. Made from spine matched and varnished Port Orford Cedar shafts and include fletchings and pile weights of your choice. These are the best of the best. Each shaft has been personally selected, weighed and spined by us to provide you with a dozen arrows that are as finely matched as possible. These arrows are weighed and matched to within 10 grains of one another (a single 5/16th nock weighs 11 grains!) and to one and a half pounds within the AMO 5lb groups. 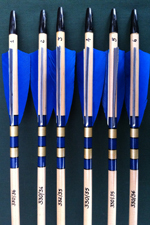 Commissions for bespoke barrelled, breasted or bobtailed arrows will be undertaken. Please contact Marc for further details.